Home » Uncategorized » It’s Pumpkin Season! Though it’s still 90 degrees here in central Missouri, September is almost over and the season of “pumpkin everything” is upon us. I personally love pumpkin; from pumpkin spiced coffee to old-fashion pumpkin pie, and everything in between. There are many ways to add pumpkin into your everyday meals, keeping it clean and healthy. I add pumpkin pie spice along with stevia to my oats, or 1/3 cup pumpkin puree, using a little less almond milk than normal. Pumpkin seeds are great, too! After we carve them at my house, I wash the seeds and toast them at 400 degrees for about 15-20 minutes, until golden, then sprinkle them with cinnamon and stevia right after the come out of the oven, so good! 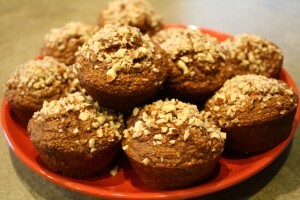 Here is one of my favorite recipes incorporating pumpkin, enjoy!